With observations and emotions I started out with dictionary definitions. With needs the definition in Nonviolent Communication is different enough from the standard dictionary definition that I think it is better to just give the NVC usage of needs. Needs are universal to all humans. Marshall says there are basically seven needs; Connection, Physical Well-Being, Honesty, Play, Peace, Autonomy, Meaning. The other words on the NVC need list are variations of the basic seven. Why do we need more than seven? If you are talking to a toddler about how your no does not meet his need for autonomy and he doesn't understand, you might want to use a different word he might understand instead of autonomy. Needs are not specific to time, place or person. Saying, "I need you to clean your room," does not fit the NVC model for use of the word need. The table below is from the Center for Nonviolent Communication list of needs. As you look at the words notice how the needs are always a positive energy. With emotions you can have positive (needs met) or negative (needs unmet) emotions. One of my NVC friends objected to my use of the word negative, because it infers wrongness or badness. For me I like negative because it tells me there is something wrong (usually my thinking) and if I identify the need I am in the solution phase. Focusing on the problem feels bad, focusing on the solution feels good. What is important about identifying needs? When we are in the need energy, being aware of our needs, it feels better. I am guessing that looking over the list of needs feels good. If you can identify something that is bothering you, drivers or mothers usually get emotions going in my classes when someone says I don't get upset about much. If you can identify the need that is causing the upset you will notice a calming affect. This is an important component of empathy. One thing that is emphasized in NVC is knowing the difference between needs and strategies for meeting needs. Needs are typically one word and universal to all humans. Strategies involve the actions to meet the needs. I have a need for order is a clear expression of a need. I need you to pick up after yourself is an expression of a strategy. A specific person taking some action. When we are giving someone empathy it is important to stick with needs and not strategies or advice until they are fully heard. And then only go to strategies and advice when asked. Sticking to needs is a real challenge for most people, we have been trained by society to fix things. People don't like "being fixed." It implies there is something wrong with them. 1. Distinguishing between needs and strategies. I need you to show me some respect. I have a need for you to help. I want my son to listen. I would like some respect. I am needing to be heard. 2. Taking responsibility for our feelings. You make me mad when you don't show respect. I feel glad that you got the promotion. I feel sad when you don't understand me. I feel annoyed when you don't address me as Sir, because I am wanting respect. When you got the promotion I was glad because I was hoping you would be recognized for all that you had done. When you look at me like that, I feel disappointment and I am guessing you are not getting what I am saying. Need: to be understood. 3. Using emotions to help identify needs. I feel I should be more organized Show: When I have trouble finding my keys, I feel frustrated and would like to be organized. You are not listening. Show: When I said, "I had a bad day," and you said "That's nice." I felt hurt. I would like to be understood. I feel intimidated Show: When you stand over me and yell at me, I feel nervous and would like to know I am safe. I feel you should do the dishes like you promised. Show: When I see the unwashed dishes I am exasperated, I remember you promised to do them. I would like some support. I feel like you seldom pick up after yourself. Show: When you leave the towel on the floor after taking a shower, I feel irritated. I value order. Where to go from here? Test your ability to recognize clear expressions of needs with the needs challenge. After needs, the next component is Requests. We need to receive empathy to give empathy. 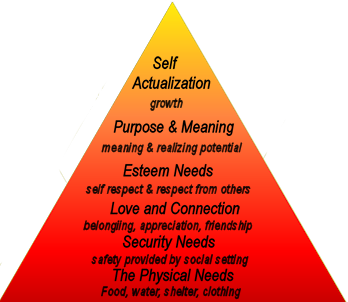 Maslow has physical needs at the bottom and self actualization at the top. The needs that are most important when needs are mostly met are the ones toward the top. The need for growth (self actualization) is most important of all. If the physical needs are not met their priority overrides other needs. Just think about a long car trip and you haven't seen a rest stop in a while, what is the only thing you can think about? Marshall's work is heavily based on Maslow. Getting in touch with unmet needs is important to the healing process. Criticism, analysis, and insults are tragic expressions of unmet needs. Every message, regardless of form or content, is an expression of a need. Self-judgments, like all judgments, are tragic expressions of unmet needs.